Carmen Guzman-McLaughlin, MPH, is the Administrator of Lehigh Valley Health Network’s (LVHN) Department of Community Health since, January 2016. Ms. Guzman-McLaughlin joined Lehigh Valley Physician Group (LVPG) as Director, Neurosciences and Infectious Diseases in October, 2010. It was a newly developed role as the Neurosciences Service Line was formalized at Lehigh Valley Health Network (LVNH). Soon after, her role was expanded to include Pulmonary/Critical Care, Chiropractic Medicine, and the expansion of Physical Medicine & Rehabilitation. 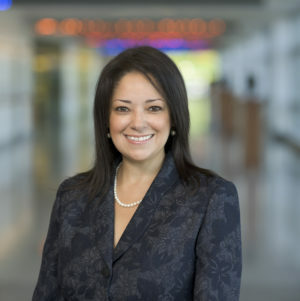 As a result, Ms. Guzman-McLaughlin has served as a principal partner bridging service line and physician group leadership to develop and implement strategic clinical initiatives such as the Advanced Spine Program, Concussion/Head Trauma Program, and Tele-Stroke and Tele-Infectious Disease Programs, to name a few. Prior to joining LVHN/LVPG, Ms. Guzman-McLaughlin was associated with the University of Medicine and Dentistry of New Jersey (UMDNJ)-New Jersey Medical School throughout her academic and professional career. Ms. Guzman-McLaughlin’s scope included clinical operations, academic training programs, and national research demonstration projects. Ms. Guzman-McLaughlin was raised in the City of Newark, New Jersey. In recognition of her academic achievements, she was awarded the Dr. Martin Luther King, Jr. Academic Scholarship. She completed her undergraduate studies at Seton Hall University in South Orange, New Jersey, where she received her Bachelors of Science in Biology. She has completed a Master’s in Public Health at the UMDNJ-School of Public Health with a concentration in Urban Health Administration.